Little Less Route (5.1 miles): rolls through River Arts District, climbs Clingman, tours Coxe Ave before heading back to Wedge at Foundation. Main Route (7.8 miles): rolls through River Arts District, climbs Clingman, tours Coxe Ave, features George Washington Carver Edible Park, but excludes the climb to Windswept and tour of Beaucatcher Greenway. Ride More Beaucatcher Route (9.8 miles): rolls through River Arts District, climbs Clingman, tours Coxe Ave, and climbs to the top of Windswept before traversing Beaucatcher Greenway. Beaucatcher Greenway in an unimproved natural surface gravel road. Participants who take on this option should be prepared for gravel conditions along the Beaucatcher. Preview the routes here on AoB’s Ride with GPS event page, and select the one that works best for you and your crew. Follow our up to the minute details on Facebook. AoB members: download your route for free! 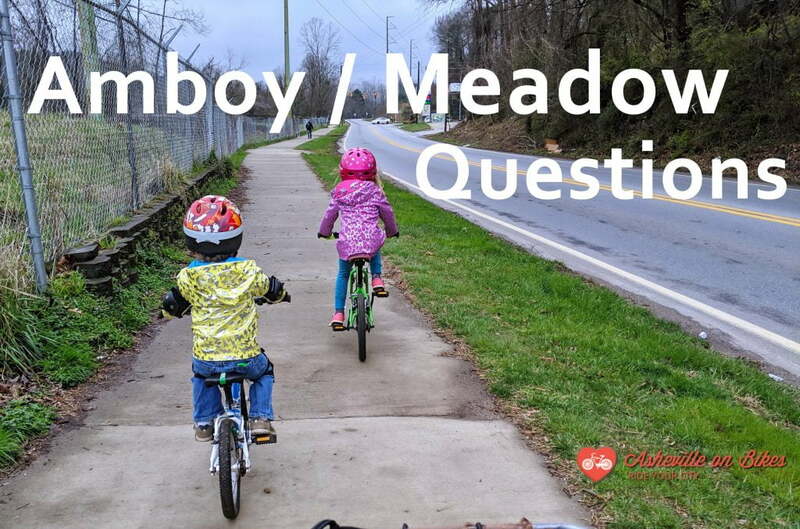 Asheville on Bikes 2019 members can download their preferred route to their device and enjoy on route turn by turn direction. Not a member yet? Join renew your annual membership online, and AoB will send you directions on how to activate your AoB Ride with GPS account. Great food, music, and beer + get a Bike of the Irish T-shirt! Come out for a great ride and post ride hang. 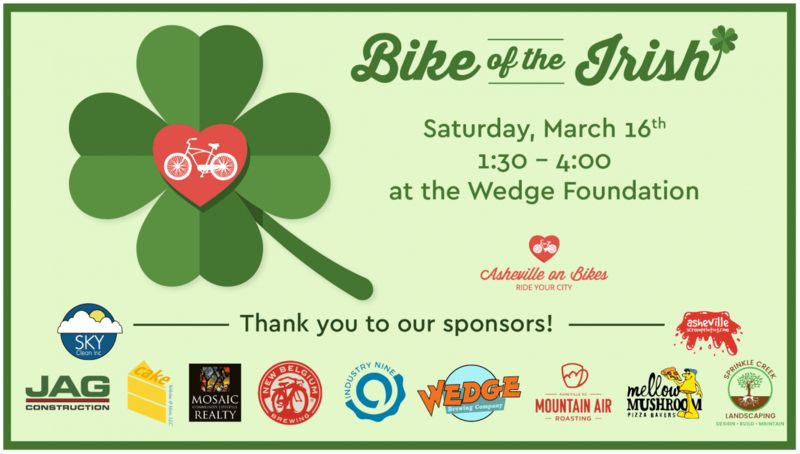 Great beer, music, and food, Asheville Screen Printing will live screen print AoB Bike of the Irish t-shirts so you can proudly wear green all year long. Want to volunteer? We’d love that! AoB welcomes Bike of the Irish volunteers. Review the volunteer options and pick the one the works best for you. Going green has never been more fun! 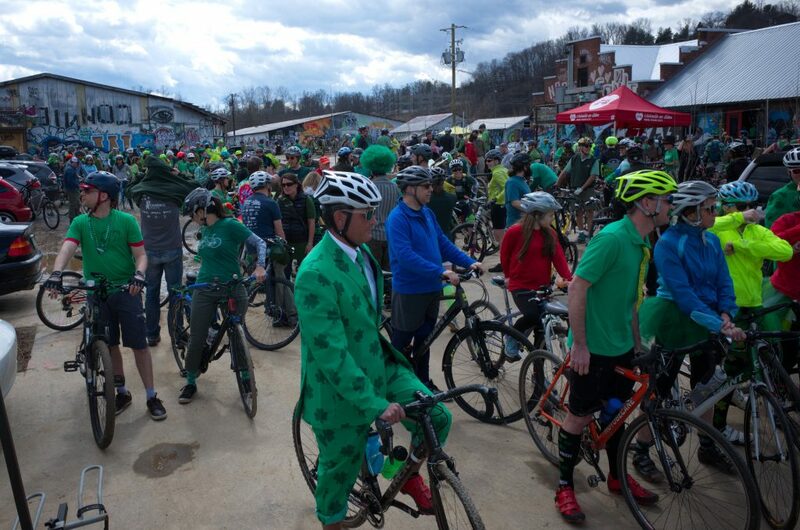 Whether it’s your first or 14th, join us for Bike of the Irish on March 16th!